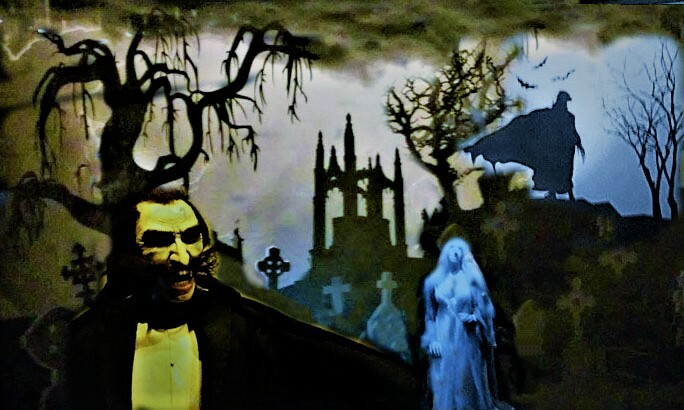 No doubt, Dear Readers, you are waiting with chilled blood and frozen heart, to learn what Hollywood Gothique did to wrap up the Halloween 2014 season. Our choice was novel - at least for us - but also traditional. After all, when the blood has dried and the shrieks have been silenced - when the haunted houses have shuttered their doors and the cemetery crypts have locked their gates, when the ghosts have returned to their graves and the costumes have returned to the closets - when all the parties are over and the very last seasonal attraction has sold its final ticket - when all of this is over and consigned to limbo until next October, one solitary fact remains: Halloween is all about the Jack O'Lanterns. 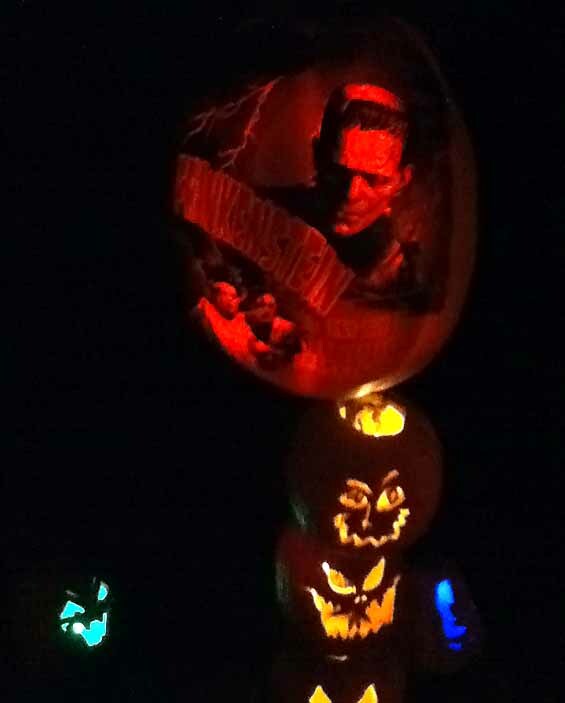 So what better way to put the spirit of the season to rest than a trip to Rise of the Jack O'Lanterns in Descanso Gardens? 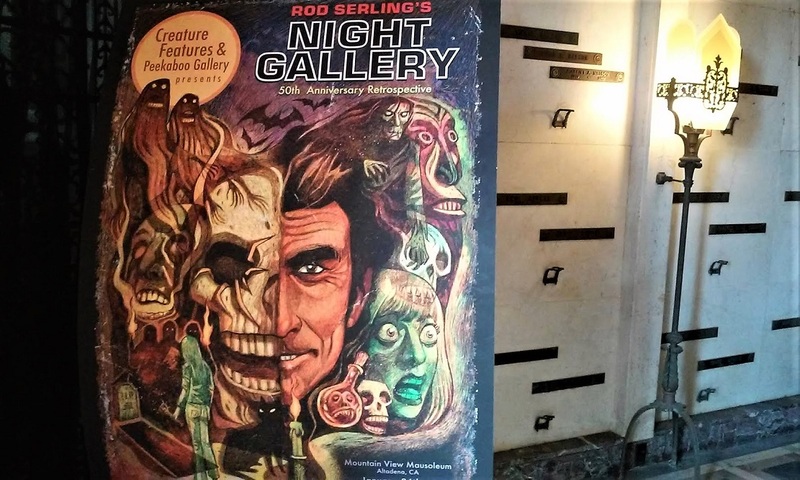 We had heard that this unusual event was more of an art exhibition than a Halloween haunt, and that turned out to be true. 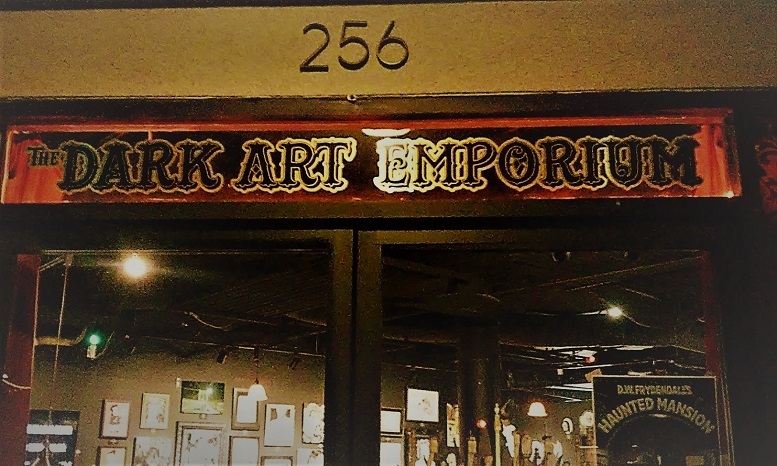 Bereft of monsters - in fact, bereft of just about anything except carved pumpkins - Rise of the Jack O'Lanterns offered a one-hour walking tour through a series of displays that were amazing in both their individual and cumulative impact. Which is to say that every one of the multitude of Jack O'Lanterns was an work of art in its own right, but those individual pieces become exponentially more impressive when arrayed in groups of dozens or even hundreds. It would be only a slight exaggeration to say that everything we saw on the path was a Jack O'Lantern. 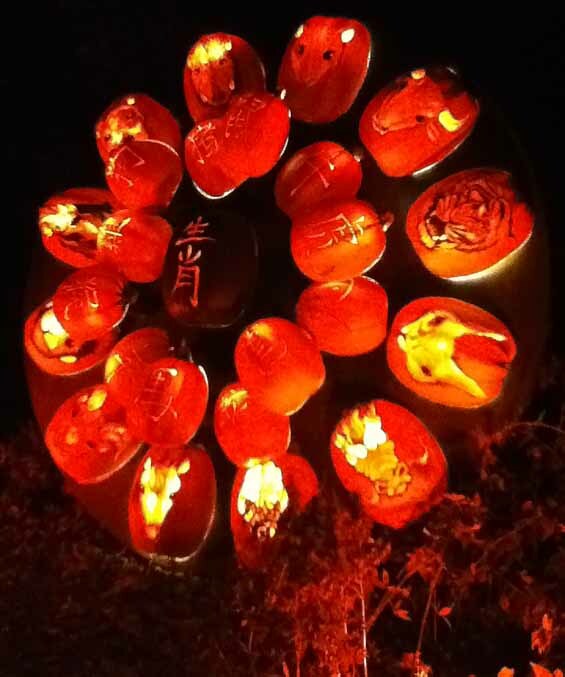 There were a few old-fashioned lanterns, and of course the foliage of Descanso Gardens, but everything else was pumpkins, arranged in a myriad of marvelous ways and providing their own internal illumination. At first, the carvings were mostly traditional - a variety of faces - but soon we noted more unusual configurations, such as giant "flowers" casting light on the other pumpkins. There were skeletons and gravestones, many with incredibly intricate designs. There were also numerous areas that presented themes: an alien invasion; classic horror movies; dinosaurs; Dia De Los Muertos; Disney's Malificent and the classic Wizard of Oz, featuring Dorothy and her travelling companions, with the outline of the Emerald City in the distance. Though most of the displays were more amusing than frightening, there were some ghoulish touches, including a series of glass containers housing what looked like severed specimen heads. Descanso Gardens offered a perfect setting; though the flowers were mostly invisible, their fragrances wafted through the air, and the trees and bushes served as a sort of natural frame for the unusual artwork. The quarter-mile trail offered an easy stroll, dense with imaginative imagery beyond what we would have expected from a bunch of squash. A family could easily navigate it, with children and/or seniors, moving as quickly or as slowly as necessary to suit everyone's attention span. Tickets were sold with specific entry times (at fifteen-minute intervals) to keep visitors evenly spaced, which worked for the most part, though some of the more impressive tableau did generate crowds of gawkers, reluctant to move on. And of course, ubiquitous cell phone cameras slowed down progress considerably, as everyone had to pause and carefully frame a shot, instead of simply drinking in the atmosphere of the evening through one's own eyes and senses. Our journey through Rise of the Jack O'Lanterns, on the evening of November 2, not long before closing time, afforded a memorable conclusion to the season, one fully in keeping with the spirit of Halloween but without the nerve-wracking horrors of theme parks and haunted houses. With demons exorcised and ghosts laid to rest, with October 31 two nights behind us but lingering in memory like a beautiful dream from which one prefers not to wake, Rise of the Jack O'Lanterns provided a last glimpse of wonder and imagination before the tolling clock eventually woke us from our reverie and returned us to mundane reality. Now say farewell to Halloween, and marvel at the sights we've seen. Rise of the Jack O'Lanterns is an annual event, which also takes place in New York. Descanso Gardens in La Cañada Flintridge was a new location for Halloween 2014; we do not know whether or not it will return there next year. Click here for the website. October 6, 2015 Steve Biodrowski, Administrator Comments Off on Win tickets to EEK! at the Greek! The best non-haunt Halloween event in Los Angeles!